This product was added to our database on Tuesday 17 April 2018. 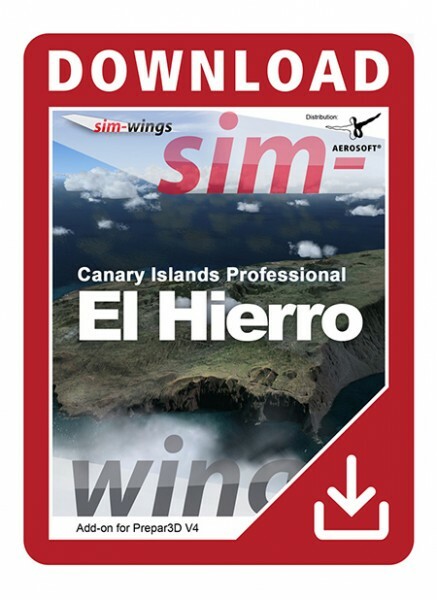 Product information: "Sim-wings - Canary Islands professional - El Hierro"
The airport and island of El Hierro are part of the long-awaited rework of Sim-wings' "Canary Islands" series for Prepar3D V4. Though the island is the smallest of the Canaries it has a beautiful charm and its airport excites with an approach demanding the pilot´s full concentration and skills. Dynamic car traffic around the airport is being supplied by the integrated AESLite. Another highlight is the excellent night texturing giving you a real "wow" factor when flying by night. This version for Prepar3D V4 further improved and extended light effects. Now El Hierro also has 3D runway lighting, dynamic apron lights and headlights for the apron traffic.